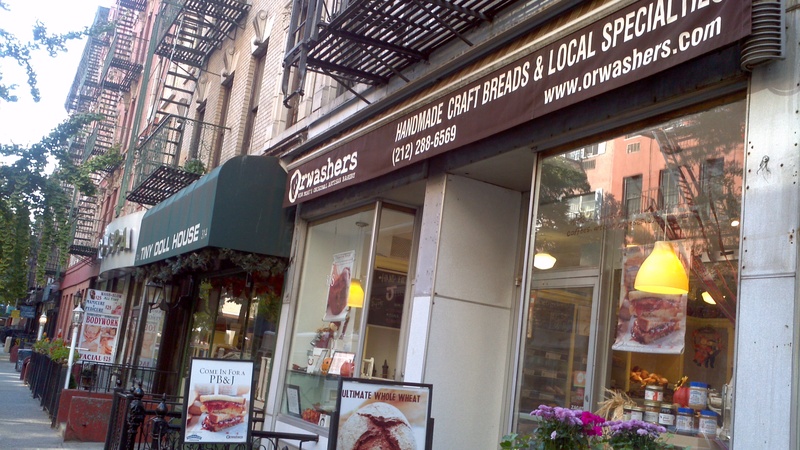 There’s a sweet bready smell in the air at Orwasher’s Bakery. It’s as inviting as the friendly service. 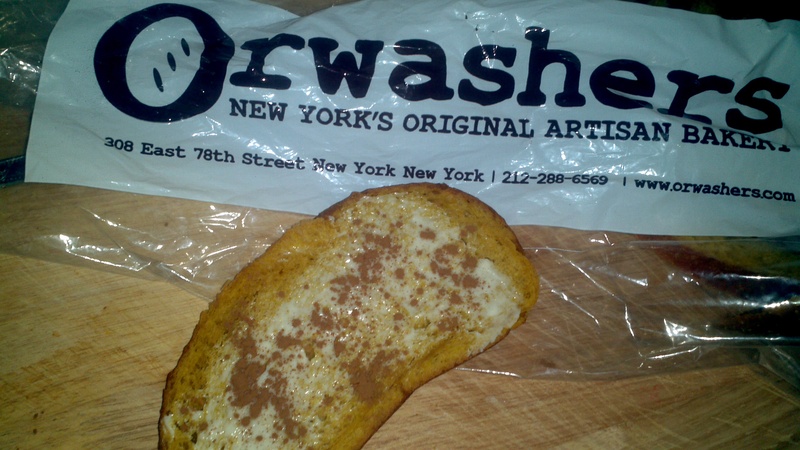 Yes, it’s true, I rarely make it up to Yorkville and the Upper East Side, but Orwasher’s alone is worth a trip. Especially for a jelly doughnut fanatic such as myself. 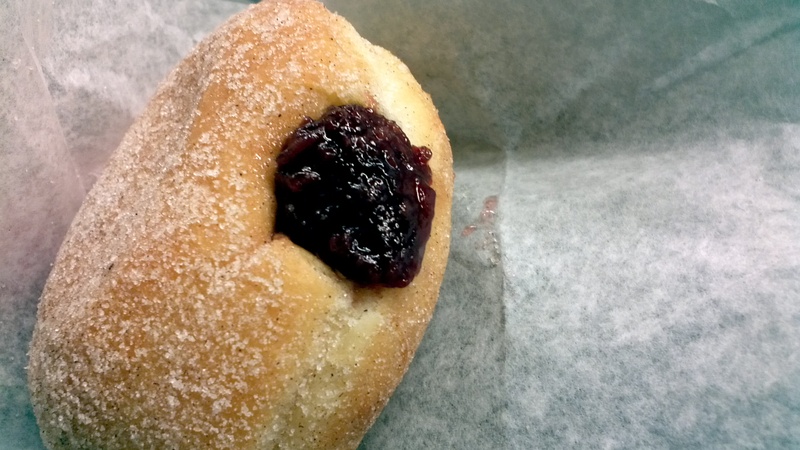 Orwasher’s has large pillowy doughnuts that are filled to order with your choice of strawberry, raspberry, sour cherry, blueberry or other fillings. Wow, I’ve never seen filled-to-order jelly doughnuts before. 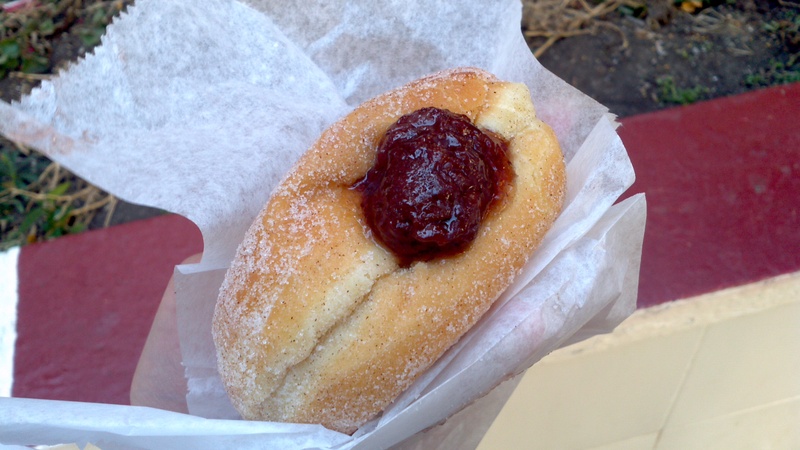 And the fillings are like preserves, not the standard blood-red goo in most commercial jelly doughnuts. The bread looks amazing here, and I opted for a the seasonal pumpkin loaf, which was out of this world good with a little butter and sprinkle of cinnamon. 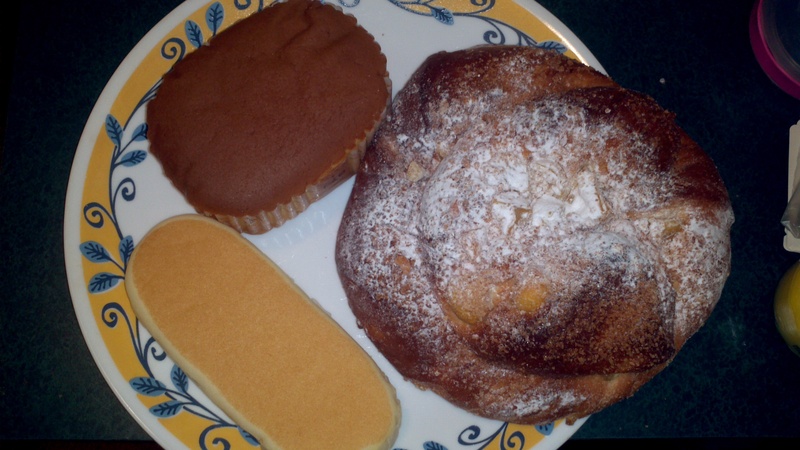 In Koreatown, NYC, there are two Korean bakeries that serve Asian and French-inspired baked goods and desserts. 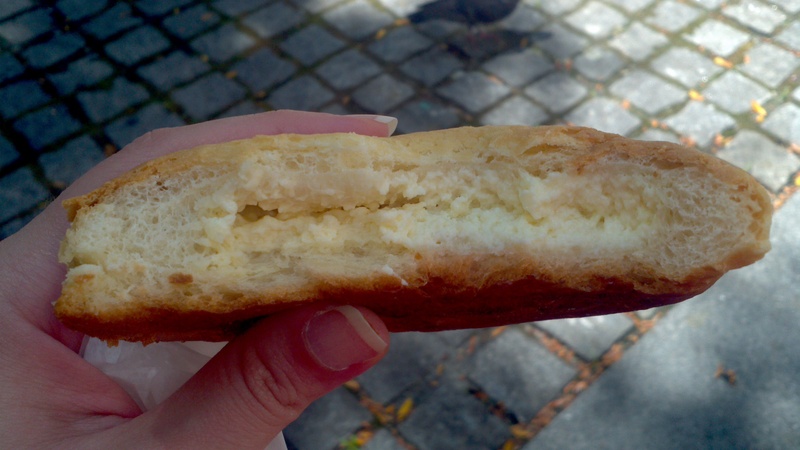 The first is Paris Baguette, which is also selling out its version of the Cronut. Paris Baguette is always crowded, and the aisle where the pastries are is a little cramped. 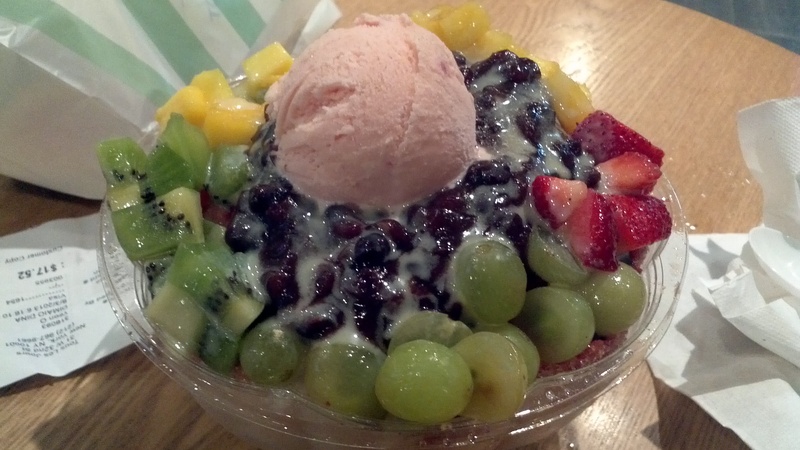 But this place has the best shaved ice, which I wrote about before. 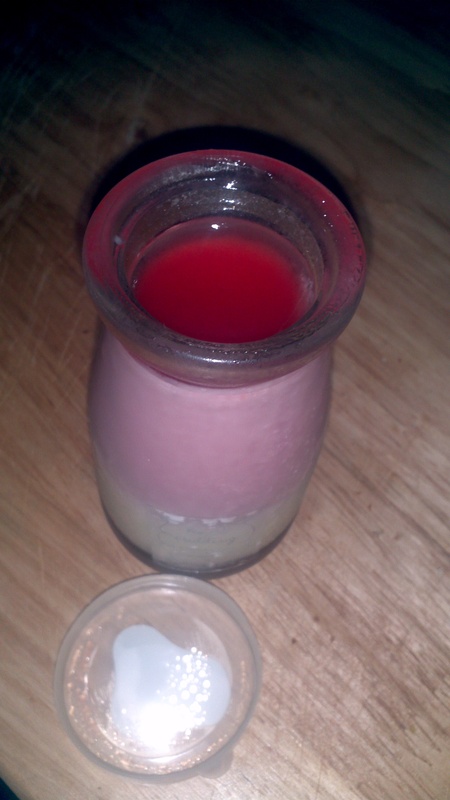 This is the cup version. I prefer the bowl version just because you can easily get to the all the flavors. This picture includes a yummy chestnut bread on the right and a sour cream bread to the bottom left with an interesting sour taste. 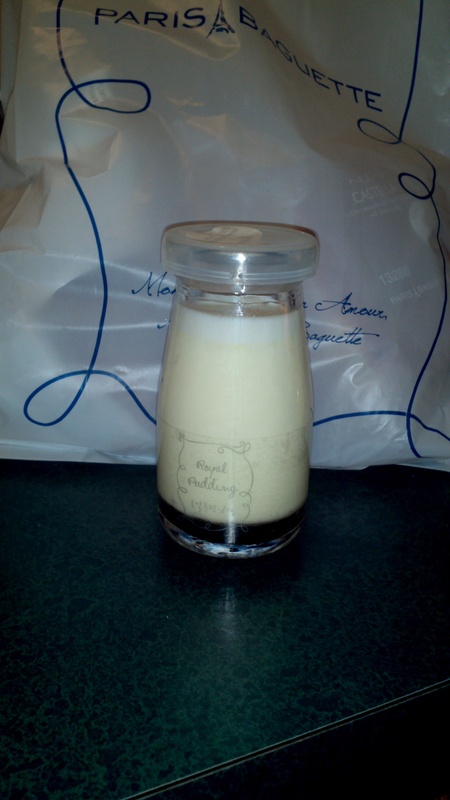 Paris Baguette also makes this milk pudding called royal pudding. I’ve tried plain and berry. Both are great, but I love the berry. And it’s served in this darling glass that you can keep! 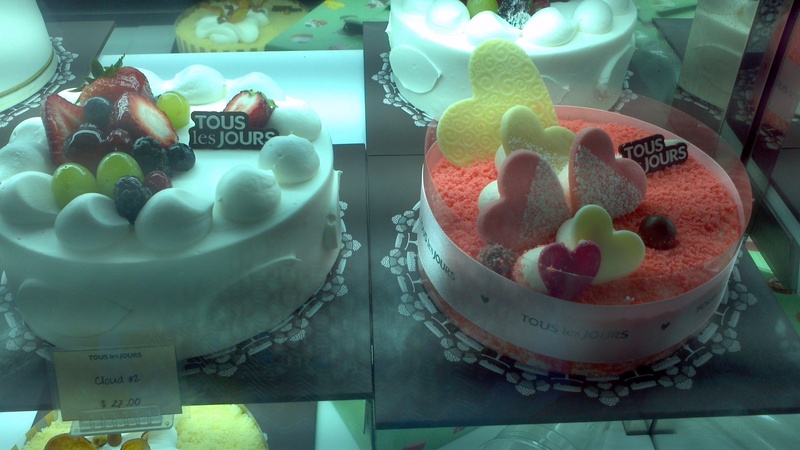 The second bakery is Tous Les Jours. 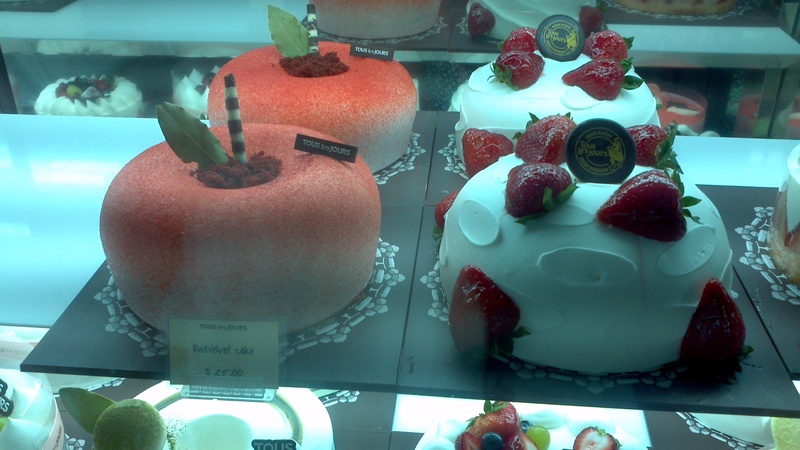 When you walk in Tous Les Jours, you’re overwhelmed with the cases of baked goods and cakes. There’s so much to choose from, and they are so lovely. Check out that red velvet cake on the left below. How pretty! This is the place to get a fancy cake for a special occasion. 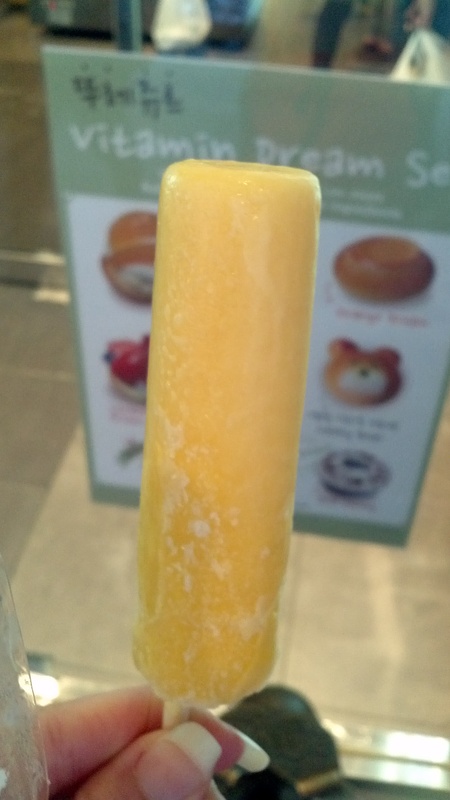 I’ve written about the honeydew ice candy I had. The mango is good too. They also make a good shaved ice. I’m addicted to a milk bread that I haven’t taken a picture of. It’s a soft yeast roll with this whipped creamy filling that is fluffy and good. Yum! 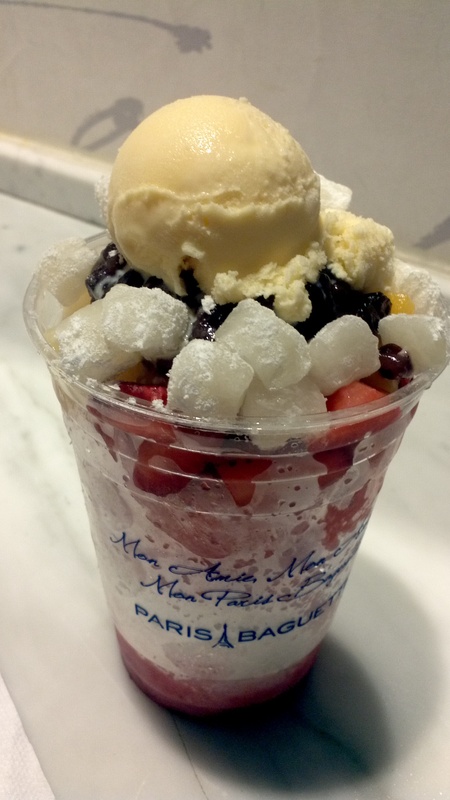 I don’t think you can go wrong at either bakery, but my favorite items so far have been the fruit shaved ice at Paris Baguette and the milk bread and honeydew ice candy at Tous Les Jours. I know I’ll be back to try more! Newark Small Business Week 2013, June 14-21, 2013, Newark, New Jersey: Support local restaurants and other businesses in Newark with discounts. Chocolate Bar Brownie Eating Contest, Saturday, June 15, 2013, 4 p.m. to 8 p.m., Manasquan, New Jersey: Presented by SquanStrong during their Tailgate on the Square event benefits efforts to rebuild the shore. Danielle Gould, Monday, June 17, 2013, 4 p.m. to 6 p.m., NYU Chemistry Department, room 1003, 31 Washington Place between Washington Square Park and Greene Street, Village: Founder of Food+Tech Connect discusses technology in the food industry as part of NYU’s Experimental Cuisine Collective. Born with a Junk Food Deficiency, Tuesday, June 18, 2013, 6:30 p.m., Mid-Manhattan Library, 455 Fifth Avenue at 40th Street, Manhattan: Writer Martha Rosenberg discusses what goes on behind the scenes at large food companies. The Food Truck Handbook, Wednesday, June 19, 2013, 6:30 p.m., Mid-Manhattan Library, 455 Fifth Avenue at 40th Street, Manhattan: Food truck owner David Weber discusses New York’s food trucks. National Dine Out Day, Wednesday, June 19, 2013: Eat at participating restaurants and a portion goes to Hurricane Sandy New Jersey relief. Union Square Wine’s Summer Tapas Party, Saturday, June 22, 2013, 2 p.m. to 5 p.m., Union Square Wines, Union Square: Rioja, Ribera del Duero, Galicia, Montsant, Jumilla and aged cheese, cured meats, and prepared dishes. Free. Southern Cuisine Dinner, Sunday, June 23, 2013, 7:30 p.m., La Casita de Porres, Brooklyn: Dinner of pickled pigs’ feet and okra, buttermilk biscuits, fish dipped in cornmeal, Broadbent Kentucky country ham, poundcake with strawberries and whipped cream and she-crab soup. $70. Sunday Brunch, Sunday, June 23, 2013, Noon, Chopsticks or a Fork, Bushwick, Brooklyn: Join other foodies for brunch. $52. MDA’s 20th Annual A Taste of Down Under, Monday, June 24, 2013, 6 p.m. to 10 p.m., Tribeca Rooftop, 2 Desbrosses Street, Manhattan: Food tastings by NYC chefs and wine and beer from Australia to benefit the Muscular Dystrophy Association. Farmhouse Fest, Tuesday, June 25, 2013, 6:30 p.m. to 10 p.m., Alewife, Long Island City, Queens: Farmhouse style beers, wines and food like cheeses, breads, meats & gourmet pickles. Tickets $65. Spina’s “Rosato Amato” Dinner Party, Tuesday, June 25, 2013, 7 p.m. to 10 p.m., 175 Avenue B, East Village: Five-course dinner with pairings of rose wines from upstate New York to Greece. $65. Vosges Haut Chocolate Tasting, Wednesday, June 26, 2013, New York: Waitlist $25. On the Chocolate Trail, Monday, July 15, 2013, 6:30 p.m., Mid-Manhattan Library, 455 Fifth Avenue at 40th Street, Manhattan: Author Deborah R. Prinz discusses the history of the chocolate trade. There may be a theme for Sweets Week this time, Japanese sweets. Lunch time at the Midtown location of Cafe Zaiya on E. 41st Street is a madhouse. The very popular Japanese spot has savory lunches available. Of course, I made my way to the bakery case. After eyeing some French-style fancy cakes and breads, I decided upon a cream cheese dome and a cream cornet. Verdict: The cream cheese dome wasn’t round or high. I’d call it cream cheese moon because with its pockmarks, it looks like the surface of the moon. The bread part was a soft, sweet bread, and the cream cheese was more like farmer cheese consistency than smooth cream cheese like we’d find in an American cheese Danish. The cream cheese was creamy and not too sweet, a good balance with the sweet bread. I liked this bread and would get it again. 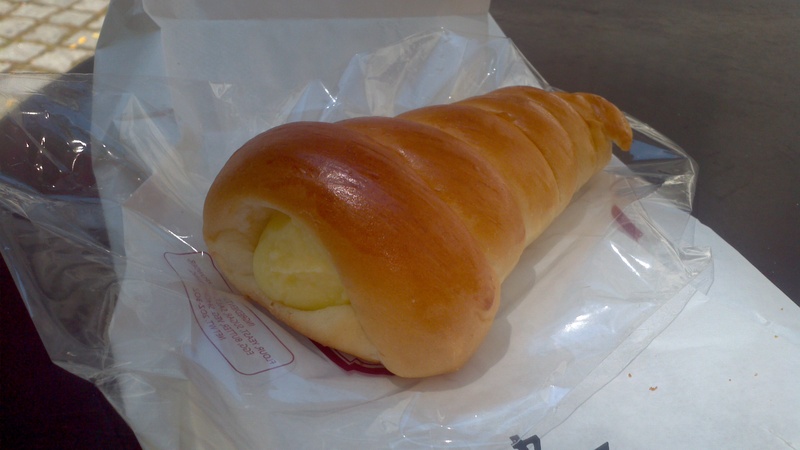 Verdict: The cream cornet should be called custard cornet, as the filling is more like a custard. I’m not a big fan of custard in pastry, but this one is not very sweet, which is nice. From what I read about cream cornets, the bread is like a soft roll. This one is very soft and tastes like a dinner roll reminiscent of Golden Corral. 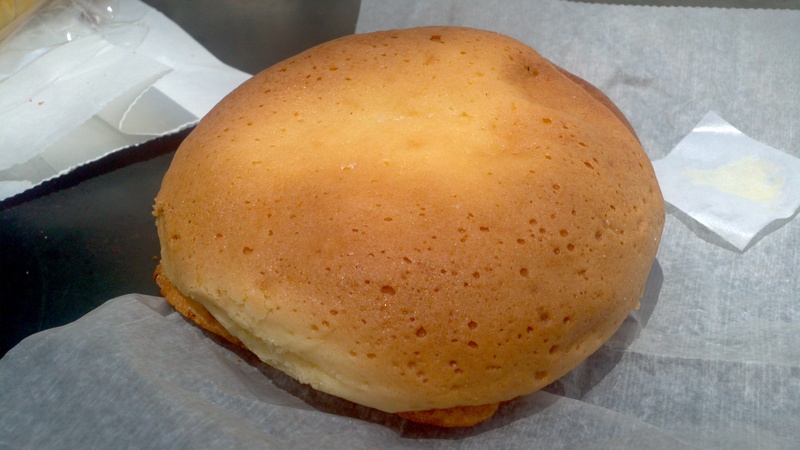 Btw, I love Golden Corral dinner rolls, but the taste and consistency don’t work well in a custard bun. Given my feelings on custard and the roll, I wouldn’t get this again.